Tonight was a night of honor, a night of gratitude, a night of appreciation and a night of fun for the dedicated ladies and gentleman of Waretown First Aid Squad 42. We had the opportunity to show our gratitude and appreciation for those agencies who have assisted our squad. Barnegat First Aid Squad 11, Lacey Township Squad 23, Waretown Fire Department, the Waretown First Aid Auxillary and the Ocean Township police department all received plaques from us showing our appreciation for their aid over the last year. The Waretown First Aid Auxillary honored us with a monetary donation of $3,000 as well as brand new CPR training devices. The Township of Ocean honored us with a monetary donation of $10,000. Former Mayor Dennis Tredy's wife, Joan, honored us with her presence just a short time after her husbands passing. She spoke a few words about her husbands civic involvement while showing appreciation for our new Captain, Michael Kane, who was present to support the family immediately upon Dennis's death. She also honored us with a monetary donation of $1,000. Various door prizes and a 50/50 raffle was given out as well. Left to right: Sean, Demetri & Brandon. Receiving awards from our squad were EMT Brandon Tolbert & Vice President/EMT Sean McTiernen for a confirmed CPR save in which the patient wanted to express their gratitude. Receiving Top Responder and Second Top Responder were Jason Dougherty & Brandon Tolbert respectively. Left to right: Jason, Angie & Demetri. Left to right: Tina Wetter, Mike Kane, Demetri, Mike Westman, Steve Emanuel, Angie Roche, Sean & Mark Tolbert. 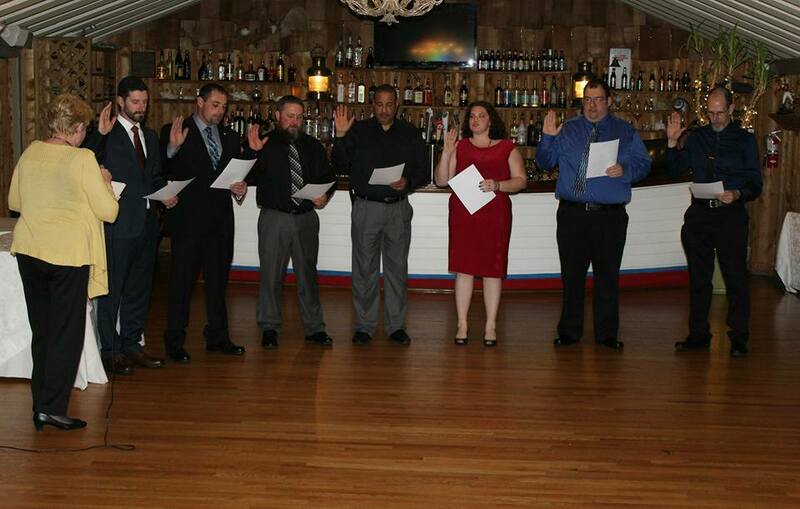 Congratulations to our new officers and to everyone who was awarded or honored this evening. We would also like to thank The Captains Inn for hosting our installation dinner. The food was delicious and well served. We look forward to an even better 2017 as our squad continues to grow and progress into the future.